I’m a fan of Laughing Cow light. I usually get their original Swiss flavor but at the Christmas Tree Shop I saw a brand called Sonoma Jacks that is the same concept but in the Garlic & Herb flavor. I was happy to see this because as you may have noticed material has been hard to come by, so hooray, a decent looking challenge! In a nice, neat foil-wrapped wedge we have a 3/4 oz. of processed cheese goodness. We found this to be very creamy smooth and very flavorful. 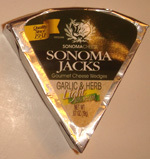 We also liked the slight tanginess and felt it provided a full-flavor cheese taste. These are a wider and flatter wedge and a slightly smaller .67 oz. Ethan felt this was more oniony. I felt like it was more herby…almost too herby. Ethan also said it tasted too “ripe”. I feel like it was too much herb and the cheese was just a tasteless vehicle for the garlic and herb. 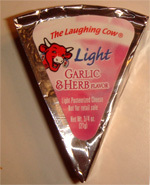 We liked Laughing Cow’s pleasant balance of cheese taste and flavorful herbiness. The emptiness of of Sonoma Just left a lacking cheese experience. 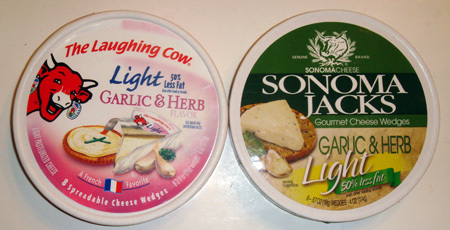 Laughing Cow or Sonoma Jacks? As I’ve mentioned before I love making macaroni and cheese from scratch but I also like testing out pre-made versions as well. 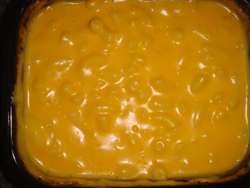 Some are terrible and some great like the very hard to find Howard Johnson’s brand mac & cheese. I’m actually not sure if it’s even still made, it’s been at least two years since I found it anywhere. 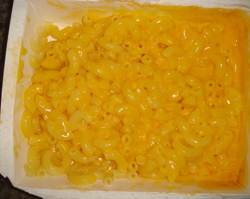 I remember the last time I had Stouffer’s mac & cheese. It was 2001 and had been dating Ethan for a few months. I came over his place after working late and eating a Stouffer’s mac & cheese and around 11pm started a vomit fest in his bathroom. I couldn’t even go to work the next day, I was too exhausted from puking all night. Someone said it sounded like it had been thawed out and then put in the freezer again so I’m guessing that’s what happened. Somehow I put that memory aside and Ethan and I evaluated Stouffer’s against Michelina’s. Looks a little too familliar to my last experience but it tasted okay. Ethan liked that it had a lot of sauce and has a good cheese flavor. 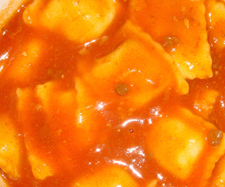 I felt like it was lacking a little sharpness to the cheese flavor but I did like the well-cooked pasta. Ethan didn’t like the lack of sauce. We both liked the flavor of the cheese but Ethan felt there just wasn’t enough of it. 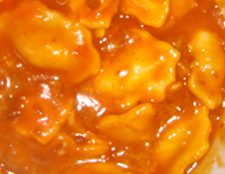 I like of liked that it wasn’t swimming in sauce and to me the flavor got to all the macaroni fine and tasted a little more realsitic than Stouffer’s. I never heard of Vinter’s before. They’re from Chicago and I lived there for a year but never noticed them, although that was in my pre-snack evaluating days. I checked out their website, and they have quite an extensive product list. I don’t know how but they managed to make it to the Dollar Tree in Ashland, MA. This bag came in a variety pack, withcorn chips and cheese puffs but since “Kurls” is spelled with a K I decided to evaluate them. Cheetos have a nice tanginess to the cheese flavoring. They also have a very satisfying crunch. It seems a little weird but I liked tasting the oil in each bite and although the oil had a presence, it didn’t make the crunch heacy and they’re not oily to the touch. These had a little less cheese flavor to them. 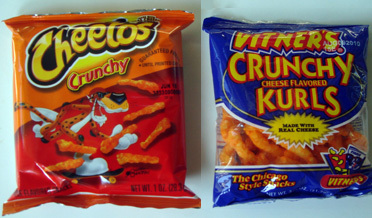 Well, they had decent flavor but didn’t have that tanginess, which gives Cheetos a little something extra. 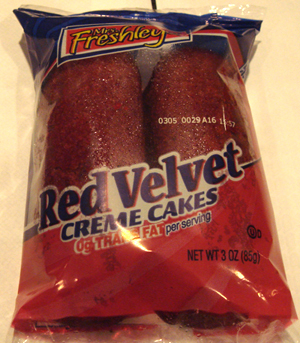 The crunch was also lacking – but, I will give them a break since these were at the dollar store and not bought anywhere near the Chicagoland area. I like to support the little guy and they may not have been given a fair shake this round, but Ethan and I both preferred the Cheetos version because of the strong flavor and delightful crunch and texture. 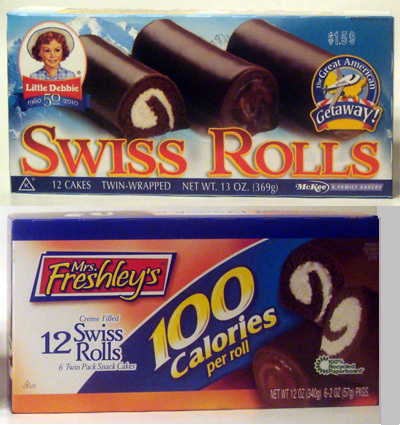 We’ve done Swiss Rolls a few times and Ethan and have preferredthe Little Debbie version but we’re always up for finding and excuse to eat these so when we found Mrs. Freshley’s verison, we were happy to evaluate. We didn’t expect much from these but they smelled good. Upon biting in to this we both found the cake to be very moist and soft. The vanilla creme is really the star of the show, it was so creamy and delicious. Ethan said the only thing not really amazing was the chocolate, it didn’t taste all that chocolatey but the creme was so good, it made up for the lack of chocolate flavor. 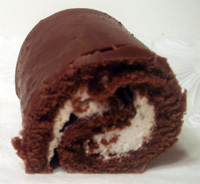 We’d still eat a Little Deb Swiss Roll but were really impressed with the Mrs. Freshly’s roll, it was just so delightful. 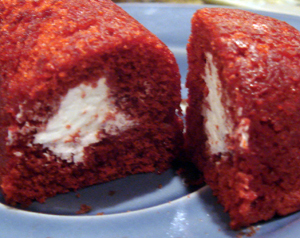 A surprise but for the first time we’ll say Little Deb Swiss Rolls has a superior. 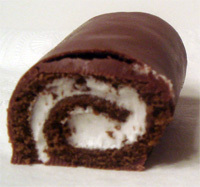 Swiss Rolls: Little Debbie or Mrs. Freshley's? 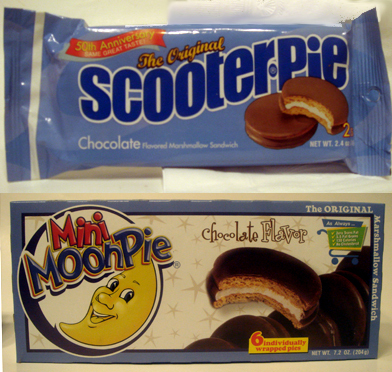 I’ve heard of Moon Pies and not sure if I’ve heard of Scooter Pies but somehow managed not to have any experience with either until today. I thought it was kind of interesting that both claim to be “the Original”. These seem to have such tasty potential: Chocolate, cookie and marshmallow. What could go wrong? So…I guess something happened on the way home from the store because when I opened the package, the marshmallow was squished out of the “sandwich”. It turns out it that didn’t really matter. The marshmallow didn’t have he capability to go far as it’s was like a thick, bouncy glue. Ethan and I were surprised that it didn’t taste very good. The marshmallow was blah, the chocolate was pretty much undetectable and I thought the cookie had kind of a chemical taste, Ethan thought he tasted a hint of banana. 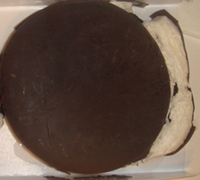 The cookie texture was odd to us too: not crisp but not soft. Like stale but according to the expiration date, it wasn’t due for the trash until the end of next month. I feel a little bad not liking either of these because I know one of these must be very popular but neither were edible beyond 2 bites. 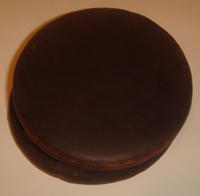 Fake chocolate, gluey marshmallow and stale-like cookies were all we tasted. I can imagine a home-made version of these would be fantastic though. 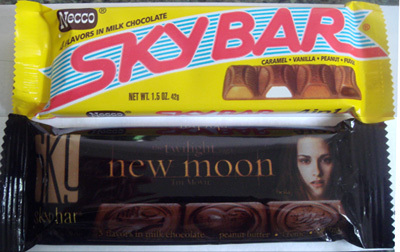 One of the great snack inventions of the 90’s (?) is Pirate’s Booty. 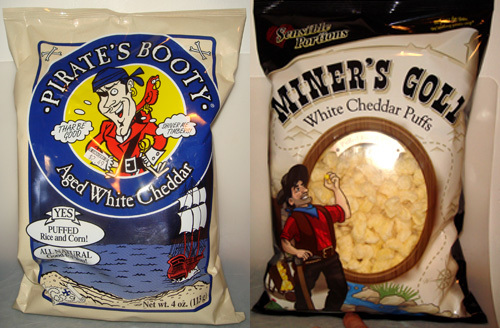 I used to love the Veggie Booty but I think I OD’d on it a few years ago I forget where we found the Miner’s Gold but of course we couldn’t pass up comparing it against the boot-ay. 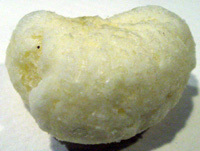 Booty is puffy and provides a soft crunch. These are made from corn and rice but the corn is the more detectable taste. The cheese flavor is mild but enough to satisfy. Ethan said this is a snack he could eat the whole bag of and not feel full. Gold is similar in texture, although not quite as crunch. 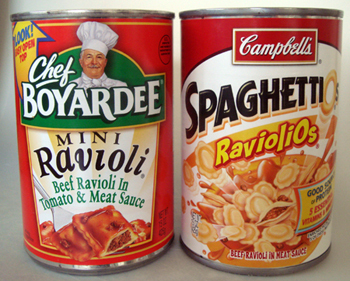 When we ate these we immediately noticed a difference in flavor. The cheese is different, we couldn’t really put words with the taste but Ethan described it as “gross” and we kind of agreed it was sharper, but still something wrong with it, kind of like a sour taste. Pirate’s Booty wins for us. The more satisfying crunch and more pleasant cheese flavor makes it a winner. I’d say Miner’s Gold is okay if nothing else is around, it’s not the worst but I wouldn’t buy it as a first choice. Pirate's Booty or Miner's Gold?